This post originally appeared on CityLab. Find the original here. The Franklin house is nothing palatial like Graceland, the mansion estate in Memphis that Presley was living in when he died. The Franklins’ small cottage resembles something more like the humble abode Presley was born in in Tupelo, Mississippi, which itself has been turned into a shrine. According to Zillow the Franklin home is roughly 1,100 square feet, which limits what can be done with it. 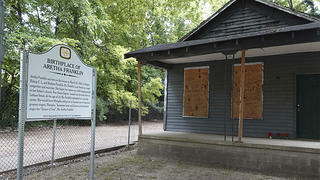 This photo from August 18 shows the home where Aretha Franklin was born, in Memphis, Tennessee. Franklin died two days earlier in her home in Detroit at age 76 from pancreatic cancer. The Franklin house is located near the south Memphis neighborhood called Soulsville, a once prominent, working-class African American neighborhood where numerous legendary soul music artists lived and worked from the 1930s to the 1960s. By the 1990s, Soulsville, along with much of surrounding south Memphis, had been starved of investment and resources, and is now home to some of the most impoverished zip codes in the U.S. Higgs and the Lemoyne-Owen College CDC have helped steer several projects over the past decade to revitalize Soulsville as a catalyst for a South Memphis rebound. 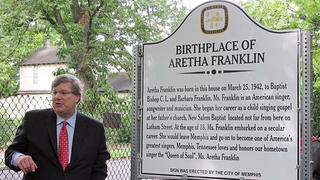 Memphis Mayor Jim Strickland stands next to a plaque marking the childhood home of soul singer Aretha Franklin. But the city wouldn’t comment on any specifics beyond that. The budget for the latest Franklin house proposal is modest—roughly $150,000, said Higgs, which shouldn’t be difficult to reach in a city that has staked much of its destination appeal on its music and civil rights bona fides. Graceland is currently amidst its own multi-million-dollar expansion that is being partially funded with public money. The city seems to be pushing back a bit on that, but the Shelby County Commission voted seven to one in June to allow it to move forward.